Recently I have been diving into the world of Assessment, seeking to better understand how we might design effective processes around this essential phase of the learning cycle. In doing so I have found a wealth of resources and quality reads that offer insights and strategies to be applied into our classrooms. Here then is a sampling of what I have been reading. 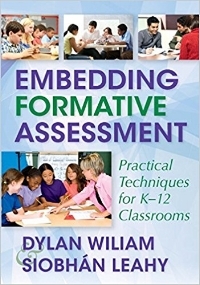 If you are interested in formative assessment then the research and writing of Dylan Wiliam is a must read. This accessible and immediately applicable book brings it all together with theory and practice covered. This is one of those books that needs to be in the hands of every teacher. Its opening chapters provide a clear understanding of the importance of formative assessment as a tool for learning and its advantages over traditional methods with their focus on measuring and recording achievement. Later chapters provide strategies to be used in developing quality assessments for learning and for activating students and their peers as agents of learning. The book is made complete through the inclusion of numerous resources for teachers to use in their classroom. If you need to beyond what is available in their book of a similar name, this professional pack will certainly meet your needs. In the two DVD set you will find video, slideshows, meeting agendas, rubrics, articles and trainer notes. The perfect set of resources for a school looking to deliver quality professional development to its teachers. The price might seem high, but when looked at as a resource with the potential to change the practice of every teacher in your team it is well worth it. Backed by extensive research and full of practical advice this is another book that will enhance your understanding and practice. The authors reveal the value of having a system for formative assessment and reveal how this might be developed. The book breaks assessment down into a set of questions which guide the learner; Where am I going? Where am I now? How am I doing? and Where am I going next? Further the authors outline the role that assessment and the four questions play in the gradual release of responsibility from the teacher to the learner; an essential step if we are to produce life-long learners. Anyone familiar with the work of Lee Watanabe Crockett will know he is on a mission to transform learning and teaching. Through the Global Digital Citizen Foundation he and his team provide an excellent range of resources for teachers looking to bring their pedagogy into the 21st Century. The “Fluencies” are at the heart of this and many students have benefited from the use of these scaffolds for thinking and learning. Have a problem to solve, use the Solution Fluency. Need to be more creative, the Creativity Fluency will guide you. Using Information or Media, there are fluencies for those too. 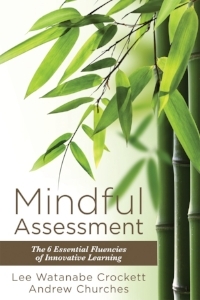 In Mindful Assessment, written with Andrew Churches the details of how to assess each of the fluencies is made clear. The book is full of resources which reveal what success with each criteria looks like and is invaluable in developing learning opportunities that will take students from where they are with their learning to where they need to be. Driving change from the middle out can be hard work even in schools that recognise the important role that their middle leaders play. The “Hacking . . .” series of books aim to empower those seeking to make changes from where they are, starting in the classroom and enlisting followers who are amazed at the results being achieved. In “Hacking Assessment” the author provides 10 hacks which can be implemented without a complete rethink of the system within which the teacher is operating. Each hack is well documented and the reader can implement just one at time, adding others as their confidence grows. Hack number six “Maximise Time” is bound to appeal to every teacher. While not strictly aimed at assessment, this book is an invaluable guide to the closely linked task of asking questions that engage the learner and require them to think deeply and develop a true understanding. If our goal is to teach for understanding, then we must be asking questions which require it. Using this book as your guide you will be asking questions that are highly engaged and that reveal where your students are with their level of understanding. One warning, the questions you ask after reading this are likely to spark lengthy debate and extended responses from your students.